Writing a presentation can be a most effective use of your presentation planning time. Should you reach for the PowerPoint application on your desktop? Or, should you write notes for yourself? That’s two options. But which one do you choose? We recommend that writing your presentation is time well-spent, since there are 5 good reasons to do so. Build a good introduction and a good conclusion. Since, writing a presentation yourself is the best way to hone a perfect beginning and end to your presentation. Therefore, you have the chance to work with the right words, test their meaning and other possibilities. Stick to your main points. Because when you write your presentation you stand a better chance of keeping to the right message. There’s less likelihood of you deviating from the points or chasing dead ends of narrative. It does happen. This property tax presentation, however, has gone entirely the wrong way. Simply too many points. Keep sentences short. When you write a presentation, particularly with a word processing package, you can clearly see your sentence length. So, keep the sentences short…8 to 12 words per sentence should be a maximum for the spoken word. That’s because short words and short sentences are best. This Chris Huhne conference speech shows how it’s done. Edit your material. You have to be prepared to edit your presentation. That’s because the flow will never be right first time. So, some of your examples will need tailoring and some points will need refining. Therefore, when you write a presentation you can edit your material quickly and easily. Rehearse against your time budget. Writing a presentation is the simplest way to guarantee that you rehearse. This is because you use the same material each time you rehearse. Therefore, if you edit your material you can make the changes accurately for each subsequent rehearsal. It’s so easily done with a written script. These Hawaii presenters made sure that practice made perfect for their hard-hitting presentation. Writing down the details of your presentation can prove really useful. So here are five tips to guide you as you start with your presentation. Build a good introduction and also a good conclusion. Stick to your main points. Edit your material as you go. Rehearse your presentation against your time budget and the clock. A PresentPerfectTM presentation skills training course will give you more practical insights into writing a presentation. 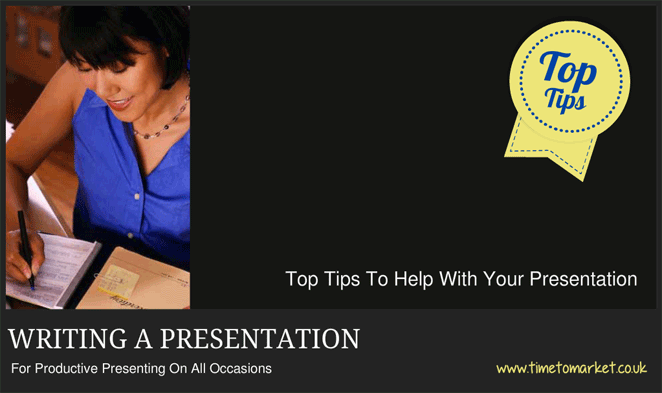 Alternatively, why not sign up to receive a regular flow of presentation tips in your email.